One non-vegan thing I’ve been craving lately is a warm, comforting bowl of mac ‘n’ cheese. I know, I know, it’s not very vegan of me, but whenever my non-veg boyfriend whips up a bowl, the smell is overpoweringly delicious and I always find myself saying, “if I only take one bite…”. 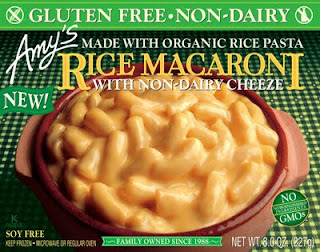 Of course, I never have taken a bite of the non-veg mac ‘n’ cheese, and now I will never be taunted with those tempting thoughts evil again, because the lovely folks over at Amy’s have brought us…dum-dum-DUM – vegan mac ‘n’ cheese!!! This mac ‘n’ cheese is made with the miracle vegan “cheese” Daiya and besides being vegan, it is also soy and gluten-free! Pretty much everyone can enjoy this convenient and tasty entrée! I found mine in the freezer section of Whole Foods. I had been looking forward to this creation ever since I heard about it from the recent Natural Products Expo West they had here in SoCal. would eat maybe once every couple of months, so the nutritional info didn’t bother me THAT much. Just be warned so you don’t experience “sticker shock” when you take a look at the label! I also noted the price, which was around $4.50, if I remember correctly. Not bad for something I wouldn’t eat that often, but still a little on the pricey side for me, especially considering the small portion of mac ‘n’ cheese offered (more on that later). I was so excited to find this new product that I quickly snatched up two boxes to take home with me. Upon returning home I popped my comfort food in the microwave…and within minutes the kitchen was filled with that same cheesy & rich aroma of the non-veg mac ‘n’ cheese my boyfriend frequently made, except this time instead of being tortured by the smell I could actually eat the Daiya-drenched macaroni! products, thus no cholesterol), it probably is a good thing it’s on the small side! Anywho, my mouth was watering as I pulled the piping hot pasta out of the microwave and I had to wait several agonizing minutes while it cooled. After pouring some rice milk to complement the meal I settled in for my first taste of macaroni and cheese in years! Let me tell you, Amy’s certainly did not disappoint! The Daiya was creamy, smooth and absolutely delightful! While I danced around and practically did backflips in honor of the deliciousness of the meal, my boyfriend, Mr. Mac ‘n’ Cheese Aficionado himself, tried it and declared, “not bad!” He stated that he could taste the difference between the Daiya and non-veg cheese (I haven’t had non-veg cheese in so long that I couldn’t tell the difference) and that the aftertaste was a little funky (another thing I couldn’t notice), but overall it was a good substitute. As I savored the dish, I also realized that despite its small portion size it indeed filled me up. Perhaps a nice green side salad would also complement it quite well, but the mac ‘n’ cheese was all I had room for that night! Great texture - Creamy, gooey and smooth! Perfect comfort food – satisfying and delicious! Amy’s Vegan Rice Macaroni and Cheeze (its official name) is truly a triumph for vegans looking for some old fashioned comfort food. It may be unhealthy and a bit pricey, but if you use it in moderation these issues shouldn’t be a problem at all. I’ve been missing mac ‘n’ cheese ever since I went vegan and Amy’s is the perfect substitute for some vegan cheesy goodness! After one bite you’ll never miss non-veg mac ‘n’ cheese ever again! Now go get your NOM NOM NOM on! Check it out on Amy's official site!